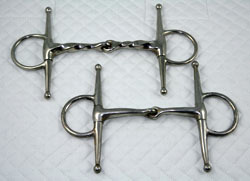 A twisted mouthpiece (top) and a smooth mouthpiece on full-cheek snaffle bits. Full Cheek Snaffle: The vertical cheekpieces prevent the bit rings from sliding into the corner of a horse’s mouth. They also help with turning the horse. 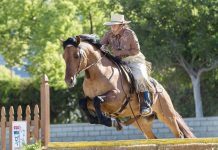 For example, when a direct right rein aid is used, the full cheek on the opposite side of the horse’s face will press against the horse’s lips on the left side, helping to turn the horse’s nose to the right. 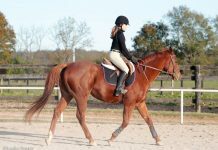 I want to start my Arab with a full cheek snaffle, which will be rubber coated. Now I am just riding her with a halteer or bosal type of halter.